One of the biggest changes in Windows 10 is how it’s been enhanced for those who have touchscreen-enabled laptops. In fact, you could use a laptop without a mouse and keyboard for the most part, if you have a touchscreen machine (though you can still use a mouse and keyboard to get anything done). Also, where Windows 8 and 8.1 had two views, a desktop and a Start screen, Windows 10 focuses on a desktop as its home base. 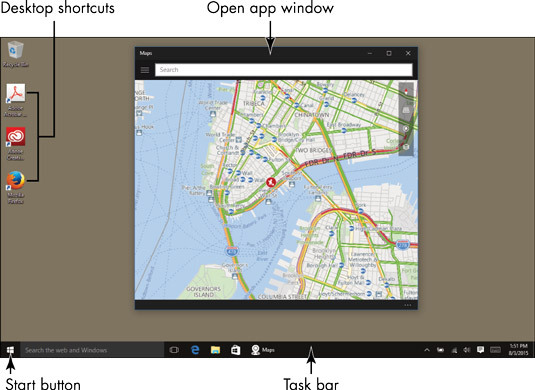 This is where windows will appear when you open apps or settings and where you can place desktop shortcuts to frequently used apps. Cortana: This personal assistant is a sophisticated search feature that can return results from a web search, a search of your laptop contents, and even apps, such as Calendar or Maps. You can also ask Cortana to take actions, such as sending an email, setting an appointment, or texting somebody. You can interact with Cortana by entering text or by speech. Task View: This new view shows you all open apps on your desktop, and even allows you to create and view multiple desktops. For example, you might have one desktop with all your work apps open and one with all your games and entertainment apps open. Action Center: This pane provides a list of notifications about items, such as new emails or appointment reminders, and buttons for various settings, such as screen brightness and network connections. 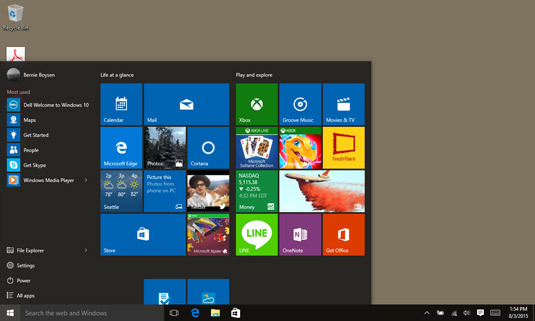 In addition to the desktop, you can open a Start menu using the Start button. This menu provides access to all apps.